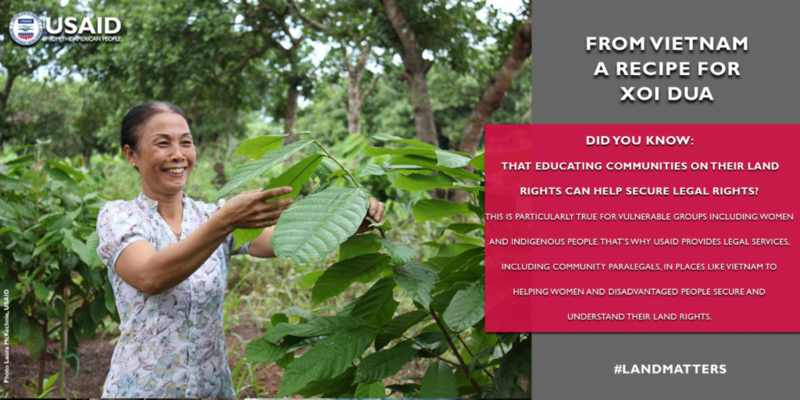 Secure land rights play a vital role in improving food security and nutrition while reducing extreme poverty and hunger. 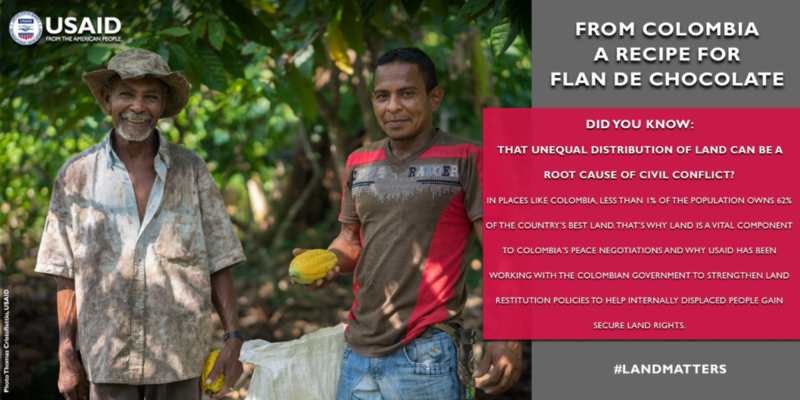 We know that farmers who are confident that their rights to the land they cultivate will be respected in the future, are more likely to invest in improved production practices, such as soil and water conservation or tree planting, that can help boost their yields and ensure their land will remain fertile for years to come. 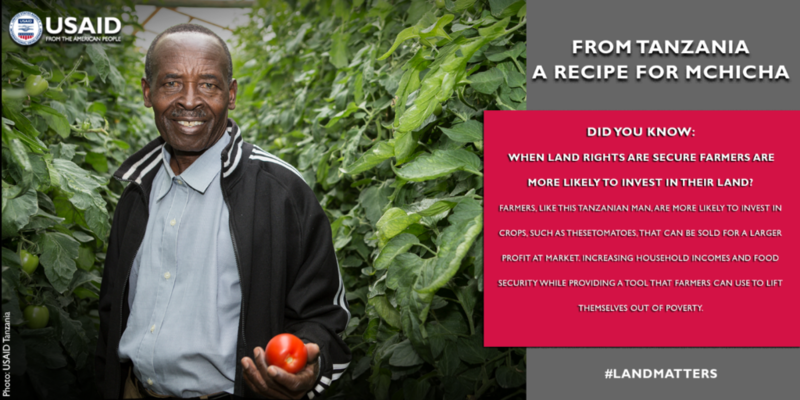 When secure property rights can be traded, whether through sales or leases, the most capable farmers, including women and the poor, are also able to acquire more land to grow their successful farms – and their neighbors can access capital to invest in off-farm enterprises that have knock-on effects and are an important building block to create more resilient rural economies. 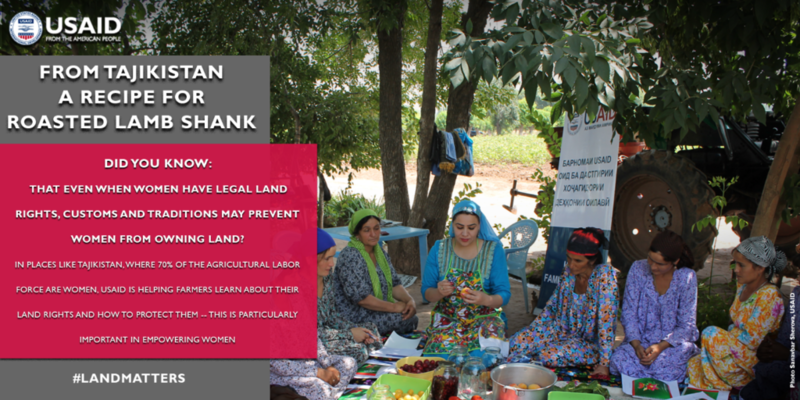 That’s why USAID’s Land Office is committed to help secure land rights for farmers and rural communities. 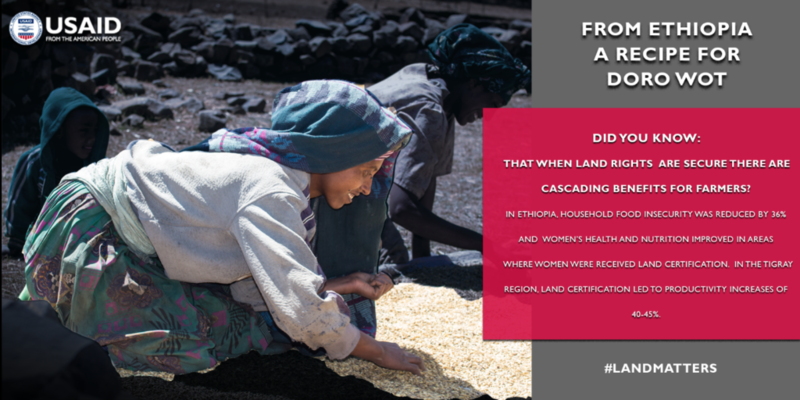 Today, in recognition of Feed the Future’s progress, we are sharing traditional recipes from some of the countries where USAID’s land rights programs have helped women and men improve their harvests and increase their incomes. Bon appetit! In a large pot, simmer onion, garlic and ginger with vegetable oil till lightly brown. Add berbere and paprika, continue to simmer for about 15-20 minutes at low heat stirring occasionally and adding a touch of water as needed to avoid sticking. Add chicken and simmer until chicken is done while adding the remaining water as needed. Finish simmering and add salt, korerima, wot kimem (mekelesha). Serve hot with injera (Ethiopian flat bread made of teff). Mix the salt, cumin, coriander, and chili pepper together. Season the lamb shanks with the spice mixture on all sides. In an ovenproof pan over high heat, sauté the meat in the oil until brown on all sides. Add the tomatoes, cover with a lid, and cook for 2 ½ hours. Remove the lid, and cook for another 30 minutes, flipping the shanks halfway through. Take out of the oven, and let rest 10 minutes. Pull the meat from the bones, trying to keep it in large chunks. Remove the skin from the tomatoes. Garnish with chopped parsley and basil. Serve over flatbread – with cooking liquid as desired. Wash and chop spinach. Peel and chop tomato and onion. Mix peanut butter and coconut milk in a separate bowl and set aside. Heat butter over medium heat in sauté pan. Add onion, tomato, curry powder and salt to pan and sauté until onions are soft – approximately 5 minutes. Add spinach and cook until wilted. Add peanut butter and coconut milk mixture to pan. Gently simmer for 5 minutes. Serve with rice, chapati. Drain the glutinous rice in a colander. Place drained rice in a mixing bowl and add salt, sugar, and food coloring. Mix well until all the grains have an even color. Add water, coconut milk and rice mixture to a non-stick pan with a lid. Turn heat to medium high and place the lid on, periodically removing it to stir the rice. Rice is done when it is sticky and translucent green. Remove the rice from the stove and let it cool for about 5 minutes. Stir in shredded coconut if desired. Serve at room temperature. Immediately pour an equal amount of the caramel into each ramekin or any ovenproof mold you want to use. Swirl each dish to coat the base with the caramel, work fast as the caramel will harden quickly as it cools. Place all the ramekins in a large roasting pan and set aside. In a medium bowl, using an electric mixer, mix the eggs, egg yolks and 1-½ tablespoons of sugar for 2 to 3 minutes. Add the condensed milk, heavy cream, evaporated milk and cocoa powder and mix for 1 more minute. Carefully pour an equal amount of the flan mixture into the caramelized ramekins in the roasting pan. Then add hot water to the roasting pan, not to the ramekins, until the water comes halfway up the sides of the ramekins.